represents a gamma distribution with shape parameter α and scale parameter β.
represents a generalized gamma distribution with shape parameters α and γ, scale parameter β, and location parameter μ. 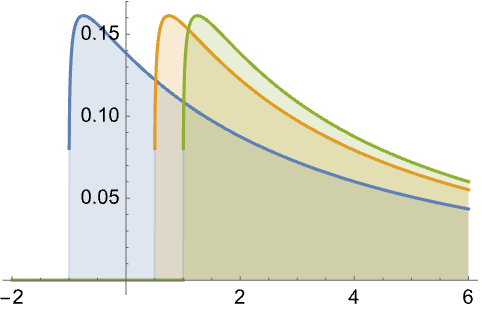 The probability density for value in a generalized gamma distribution is proportional to for , and is zero elsewhere. 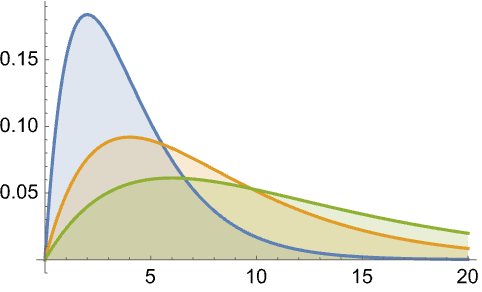 GammaDistribution allows α, β, and γ to be any positive real numbers and μ to be any real number. 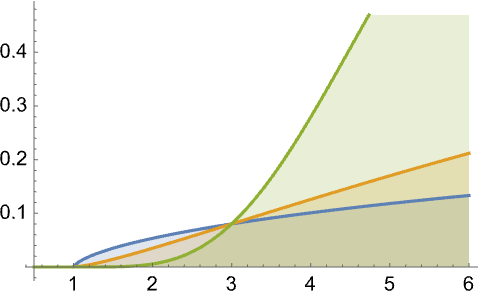 GammaDistribution[α,β,γ,μ] represents a continuous statistical distribution defined over the interval and parametrized by a real number μ (called a "location parameter"), two positive real numbers α and γ (called "shape parameters") and a positive real number β (called a "scale parameter"). The parameter μ determines the horizontal location of the probability density function (PDF) of the gamma distribution. The shape of the PDF is entirely dependent upon the combination of values taken by α, β, and γ and may be either unimodal or monotonically decreasing, with a potential singularity approaching the lower boundary of its domain. In addition, the tails of the PDF are "thin", in the sense that the PDF decreases exponentially for large values of . (This behavior can be made quantitatively precise by analyzing the SurvivalFunction of the distribution.) The four-parameter version is sometimes referred to as the generalized gamma distribution, while the two-parameter form GammaDistribution[α,β] (which is equivalent to GammaDistribution[α,β,1,0]) is often referred to as "the" gamma distribution. The (two-parameter) gamma distribution dates back to the 1830s work of Laplace, who obtained it as a posterior conjugate prior to distribution for the precision of normal variates, though the generalizations to three- and four-parameter forms can be traced back to Liouville's work on the Dirichlet integral formula. The name of the gamma distribution derives from the presence of the gamma function in its PDF. 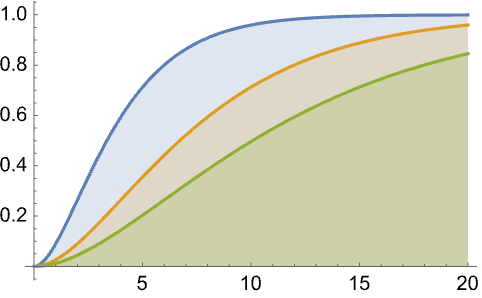 The gamma distribution is used to model a number of quantities across various fields. In statistics, the gamma distribution is the distribution associated with the sum of squares of independent unit normal variables and has been used to approximate the distribution of positive definite quadratic forms (i.e. those having the form ) in multinormally distributed variables. The gamma distribution has also been used in many other fields, including meteorology, mathematical finance, statistical ecology, population dynamics, genomics, neuroscience, and actuarial science. RandomVariate can be used to give one or more machine- or arbitrary-precision (the latter via the WorkingPrecision option) pseudorandom variates from a gamma distribution. Distributed[x,GammaDistribution[α,β,γ,μ]], written more concisely as xGammaDistribution[α,β,γ,μ], can be used to assert that a random variable x is distributed according to a gamma distribution. Such an assertion can then be used in functions such as Probability, NProbability, Expectation, and NExpectation. 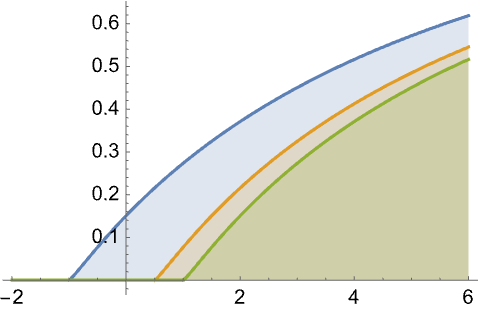 The probability density and cumulative distribution functions may be given using PDF[GammaDistribution[α,β,γ,μ],x] and CDF[GammaDistribution[α,β,γ,μ],x]. The mean, median, variance, raw moments, and central moments may be computed using Mean, Median, Variance, Moment, and CentralMoment, respectively. DistributionFitTest can be used to test if a given dataset is consistent with a gamma distribution, EstimatedDistribution to estimate a gamma parametric distribution from given data, and FindDistributionParameters to fit data to a gamma distribution. ProbabilityPlot can be used to generate a plot of the CDF of given data against the CDF of a symbolic gamma distribution and QuantilePlot to generate a plot of the quantiles of given data against the quantiles of a symbolic gamma distribution. TransformedDistribution can be used to represent a transformed gamma distribution, CensoredDistribution to represent the distribution of values censored between upper and lower values, and TruncatedDistribution to represent the distribution of values truncated between upper and lower values. CopulaDistribution can be used to build higher-dimensional distributions that contain a gamma distribution, and ProductDistribution can be used to compute a joint distribution with independent component distributions involving gamma distributions. 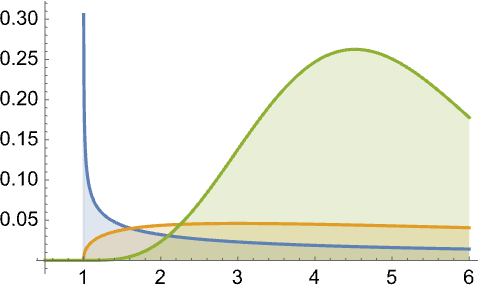 The gamma distribution is related to several other distributions. 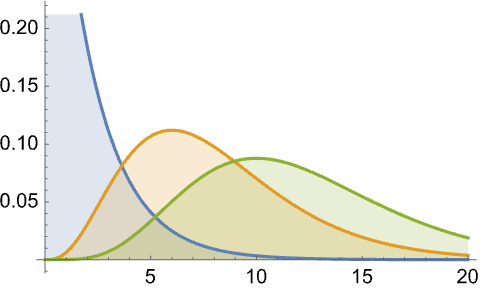 As previously noted, GammaDistribution is firmly rooted in its relationship to NormalDistribution and MultinormalDistribution and is the conjugate prior (in Bayesian inference) to a handful of distributions, including PoissonDistribution, NormalDistribution, ExponentialDistribution, and GompertzMakehamDistribution. 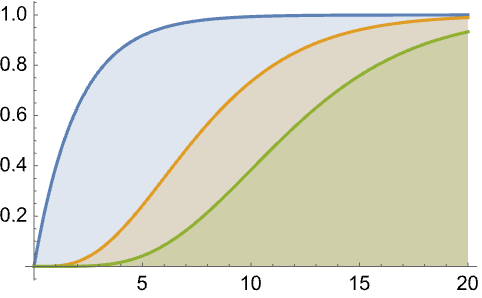 GammaDistribution generalizes ChiSquareDistribution (the PDF of GammaDistribution[ν/2, ,2,0] is the same as that of ChiSquareDistribution[ν]), ExponentialDistribution (the PDF of ExponentialDistribution[1/λ] is the same as that of GammaDistribution[1,λ]), and MaxwellDistribution (the PDF of MaxwellDistribution[σ] is precisely the same as GammaDistribution[3/2, σ,2,0]). It can be transformed to obtain distributions such as InverseGammaDistribution, MoyalDistribution, and LogGammaDistribution. GammaDistribution is also related to PearsonDistribution, ErlangDistribution, BetaDistribution, ExpGammaDistribution, RayleighDistribution, ChiDistribution, WeibullDistribution, and StudentTDistribution.